Does anyone else remember those petrifying Time-Life commercials that used to run in the late eighties? 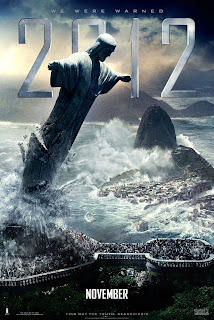 The ones attempting to hock expensive, oversize coffee-table books and videos about the Mayan civilization by using apocalyptic imagery of lava-spewing volcanoes and cracked land masses while an ominous booming narrator sternly warned, with alarming relish, that the world would come to an end on December 21st, 2012 *Insert deafening thunder-crack here*? When I was about 9-years-old, myself and my younger sister Janine stumbled across one of those sanity-shaking ads one evening at my Grandparents whi le searching the dial for an episode of Dog House or Deke Wilson’s Mini-Mysteries. Needless to say, our initial transfixion, gazing wide-eyed at the unsettling cataclysmic visions and absorbing the bombastic chanting choir-from-Hell soundtrack, quickly turned to teary-eyed anxiety attacks, fretful nausea and more than a couple sleepless nights for the entire family. 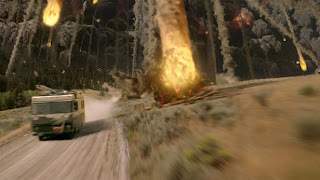 Those life-long unpleasant memories lingered in the darkened air as I took my front-row seat for director Roland “Master of Disaster” Emmerich’s 2012 - a CG-slathered exploitative attempt to play upon the infomercial-fuelled Armageddon-apprehensions of saps like me – prepared to have my worst childhood fears realized for 158 long minutes (!). And indeed, the film’s early shots, scored to Harald Kloser and Thomas Wander’s low, seat-rumbling score and depicting our spherical, blue homeland lining up portentously with the surrounding planets, seemed to set the stage for a traumatic personal déjà vu experience to take place. But as soon as Chiwetel Ejiofor’s determined scientist Adrian Helmsley strode confidently onto the screen, demanding answers for the global-warming epidemic from a sweaty colleague played by Jimi Mistry, I relaxed entirely. For, in wide-grinning, goofy spirit, 2012 is nothing if not a through and through spiritual cousin to Emmerich’s previous smash-the-Earth spectacles The Day After Tomorrow, Godzilla and Independence Day; a super-sized cheese-ball epic where the wobbly dialogue and performances are infinitely more tragic than any amount of catastrophic carnage on screen. With doomsday acting as a clothesline (our planet’s core is being micro-waved by an influx of neutrinos – not those elf-life aliens from the Teenage Mutant Ninja Turtl es cartoon, but rather energy particles originating from the sun – which causes rapid crust heating and plate destabilization) we’re left with an intentionally diverse, broadly-sketched group of survivors who must undergo soap opera-style character arcs while racing to safety or, more often than not, their own grim demises. Each of these deaths can usually be telegraphed, in typical Disaster Movie style, by separating those who are pure-of-heart and have precocious young children and/or prospects for future importance from those who are just along for the ride. 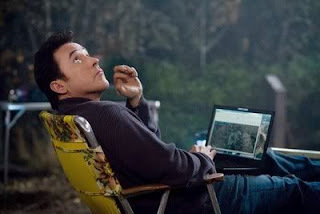 Besides Ejiofor’s Helmsley, the rag-tag group consists of failed sci-fi writer Jackson Curtis (John Cusack), father to Noah (Liam James) and Lilly (Morgan Lily) and former husband to Kate (Amanda Peet, working in three modes: hysterical, nagging and adoring) – who’s now living with yuppie plastic surgeon Gordon (Tom McCarthy). There’s also a wing-nut conspiracy theorist (real-life wing-nut conspiracy theorist Woody Harrelson) as well as Jackson’s creepy, greasy Russian boss (Zlatko Buric, sounding like Jabba the Hutt after a week-long bender) and his cosmetically enhanced trophy girlfriend (Beatrice Rosen). 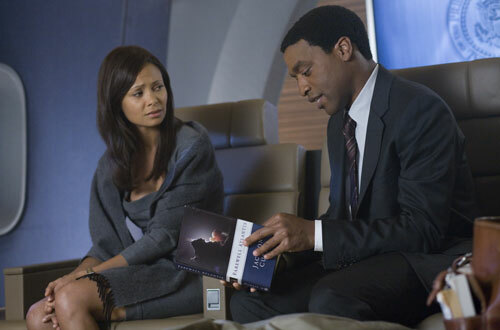 Lastly, the American government is represented by Danny Glover’s gracious and noble Prez, Oliver Platt’s slimy, wrong-at-almost-every-turn Chief of Staff and Thandie Newton’s first daughter. 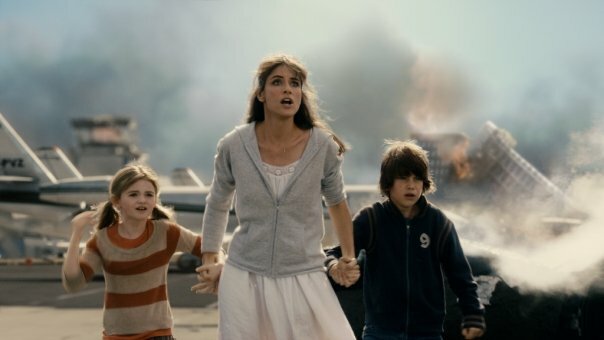 Movies of this genre have never been known for their rich characterizations, but the better ones – Independence Day included – intentionally chose larger-than-life charismatic actors to fill in the blanks and inspire an effective, if completely hollow, emotional connection. 2012 is noticeably deficient of these strong A-type personalities, with only Cusack, Platt, McCarthy and Ejiofor – a masterful actor capable of delivering even the most awful verbal swill with complete, authoritative conviction – managing to create any real impression amidst the computer-driven effects surplus. Obviously the effects are the true star of the film and they are certainly sensational – for the first half of the film. 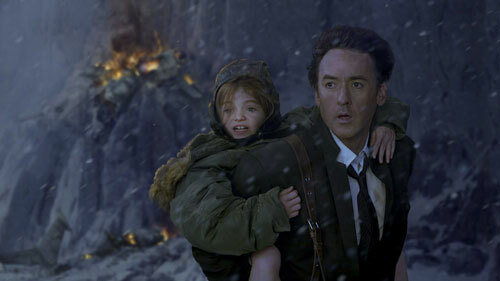 Cusack and co.’s limo escape from the fissure cracked streets of L.A., where houses crumple like gingerbread and cars slide into the yawning abyss, is among the year’s greatest technical achievements. 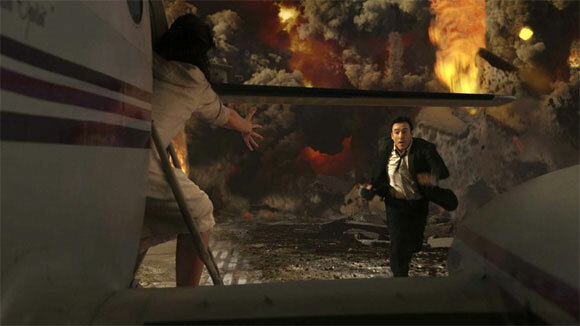 There’s an ugly magnificence to Emmerich’s devastation and one white-knuckle moment, in which a plane takes off from a collapsing runway and soars through a disintegrating office building – you can even see little people clinging to tables – is jaw-droppingly astounding. Unfortunately, the pandemonium grows a tad stale midway through, when the action leaves the U.S.A. and the environments become murkier and more indistinct and a tacked on Poseidon Adventure finale takes over, that is, considering what’s preceded it, a bit of a yawner. 2012 by no means qualifies as a “good film”; it’s too long, stuffed stupid with hoary speeches about humanity and the meaning of existence, and often disturbingly cynical (especially in portraying the unceremonious, cruel deaths of two heroic ch aracters). Yet, as a messy big-screen, big sound experience, it’s strangely engaging. Few filmmakers are working on as gleefully gargantuan a scale as the German Auteur of Annihilation, and he proves once again that no one grasps the earnest ludicrousness and Rah-Rah! camp of the Irwin Allen 1970’s Disaster blockbusters quite like he does. It may be the end of the world as we know it but, with Emmerich in charge of conducting the chaos, I feel just fine.